Most of us, I suspect, share a feeling that poets are a different breed, that they inhabit a distant land – perhaps that they are loftier or more intellectual or more bohemian than us. For these reasons, I had always been drawn to prose and, for the first decade of my career, I worked on honing my skills as a writer of fiction and non-fiction. Informed by my reading and teaching of poetry, the sound of my prose was always as important to me as its sense yet I kept my own poems in notebooks and desk drawers, showing them only to trusted friends. When I was awarded an Arts Council Writing Residency at Sunnyside Rural Trust, I was excited by the prospect of supporting the participants to write short memoirs about their lives. The people I worked with at Sunnyside all have learning disabilities, and their voices and experiences have too often been silenced. As a fiction writer, I hoped that I might be well placed to read the spaces between the words; decipher non-verbal communication; and, perhaps most importantly, listen with the heart. Yet, as the residency progressed, poetry announced itself as the most appropriate container for the tantalising gaps, silences, repetitions, and musicality of the stories shared by Sunnyside participants. As I listened through the recordings of a year’s worth of workshops and interviews, I realised that the participants had given me the gift of poetry. Here were poets, I realised – their voices both foreign and familiar; their view on the world demanding to be heard. These poets at Sunnyside Rural Trust allowed me to see that poetry is all around. 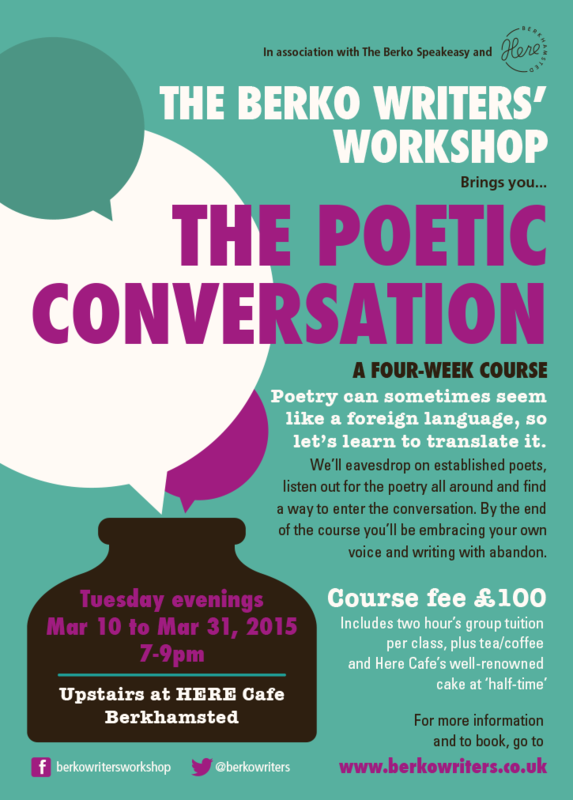 My four-week course with Berko Writers’ Workshop offers you that same gift. Love this, Emma Claire, and wish I (we) could attend. We continue to think of you often, and we always miss you. I’ve made significant inroads on the project that your Sunnyside work inspired: Yolanda, an Oral History in Verse. Many drafts of about thirty-five poems. Perhaps another fifteen or twenty, and off it goes. I’ve sent out individuals, batches, and chapbook size collections. One’s due out in July, and I’m waiting to hear about others. Meantime, work and things go on. Deedle and I will attend the AWP conference in Minneapolis in April (I’m on a panel), and I’ll visit Bacolod, Philippines for a week-long conference end of the month. Then we both head off to Philippines mid-May, for how long we’re not certain. I’ve been granted our version of a sabbatical–full course release for the Fall semester–so we might hang around longer. Whatever we do, we wish could stuff you into our duffel (well, into Deedle’s duffel) and carry you along. I’m so glad to hear that your Memoir Garden inspired project is going so well. How can I get my hands on some of these poems?